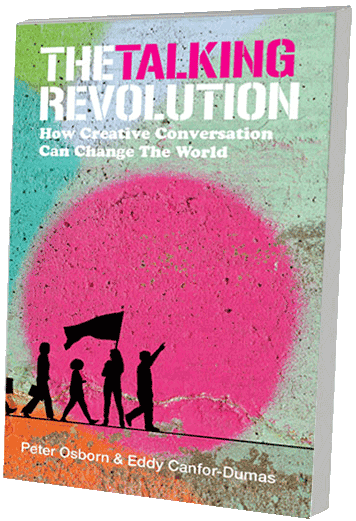 The answer is Creative Conversation – a way of talking which seeks to create something valuable in every exchange, whether it’s a brief chat or a major negotiation. Creative Conversation comprises six key elements. Individually they’re powerful. Collectively they’re revolutionary. Personal responsibility is about our attitude to ourselves. It’s about seeing ourselves as the active agent at the centre of things. As a result, any changes we make in our behaviour can give any of our relationships a boost – maybe strengthening a friendship, ending an old feud or simply creating a better atmosphere – which can, in turn, affect our whole network. Openness is about our attitude to others and what they care about. It takes openness sustained over a period of time to build (or rebuild) relationships. To understand the human needs underlying the thoughts and actions of other people – and our own. And to constantly seek to expand communication bandwidth between ‘us’ and ‘them’ so there’s resilience in our relationships, even where there’s disagreement. Creativity is about the potential for each and every conversation to create something of value – by addressing the basic needs of those involved. This spirit of creativity can take some work to develop. It has to be quite robust – stubborn, even – as our needs are often expressed in a negative form precisely because they’re not being met. Understanding First is about developing the discipline of being clear about what the other person is saying as the initial goal in any conversation. It means working to articulate our understanding of what’s being said to us before challenging it or expressing our own view. If there’s one golden rule of Creative Conversation, this is it. Challenging is about how to create value when people see things differently and test what’s being said in a way that opens things up and creates stronger connection, rather than shutting things down or causing rows. Challenging is always, well, challenging. But when done well it can transform the most difficult situations and dysfunctional relationships, and be a great spur to progress. Being understood is about ensuring that what we ourselves ‘transmit’ is received with clarity and understanding by whoever we’re talking to. It’s about framing and ordering what we’re saying in ways that ward off hidden confusion (and the problems that can flow from it) and help the listener fully understand. All of these factors are overseen by our ‘Conversation Manager’. This is the part of our consciousness that works away in the background to decide, moment by moment, who to talk to, what to talk about, whether or not there’s value in it, and where, when and how that conversation might best happen. Creative Conversation makes us more aware of our Conversation Manager so we can manage conversations better.